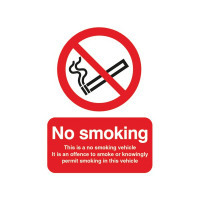 This sign is for use in a vehicle where smoking is prohibited and informs users of legal requirements. The sign uses a universal colour scheme and recognisable symbol, which conforms to BS EN ISO 7010 and is instantly recognisable. This self-adhesive sign measures 100x75mm.